Centre d’Etudes, de Formation et de Recherches en Développement (CEFRED), Ecole Nationale d’Economie Appliquée et de Management, Université Abomey-Calavi (UAC), 05 BP 1652 Cotonou, Republic of Benin. *To whom correspondence should be addressed. E-mail: fanougboisaac2@yahoo.com. Received 10 January, 2018; Received in revised form 23 February, 2018; Accepted 27 February, 2018. Air pollution, Risk of mortality, Willingness to pay, Probit. 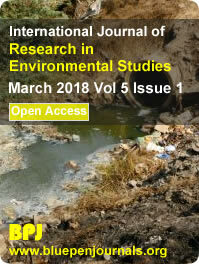 In air pollution context, the database of at least 40 years old of Cotonou citizens was used to make an evaluation of the statistical value of life (SVL) from the maximum willingness to pay (WTP). With a two-step Heckman model, the average of maximum WTP was estimated. The average of maximum WTP represents the psychological cost of mortality and is worth FCFA5, 924 per month. Hence, for a reduction in the probability of death of 5/10,000 per year over a period of ten years, the annual SVL related to air pollution mortality in Cotonou was calculated and is FCFA 142,760,000. For the first time in Benin, the SVL is one of the few indicators needed for environmental policy that has never been calculated before. Thus, the SVL allows the authorities to reinforce the decision-making while paying more attention to the effects of air pollution on the populations’ health.